You honed your build queues, perfected your move-attack orders, and memorized the fastest ways to turn your enemies into fireballs. Now the time has come to truly put those skills to the test. Summer is coming, but that is of little relevance to those who travel the stars. The next release for the FXmod is around the corner, and is bringing with it the greatest challenge for pilots and Fleet Commanders alike yet. Competition is brewing, and a special reward awaits he who manages to climb higher than anyone else in launch event for the upcoming Skirmish Mode. Read on for sneak-peaks, previews, and all the other stuff that you probably clicked on this article for. The first piece of news is that the next update for the FXmod is almost ready to roll out. The guys are doing some last minute tweaks and changes, but as things are looking now we expect to release v1.30 somewhere within the next few days or week. So, what is there to look forward to? For starters, we have addressed the issues with AI behavior that many of you pointed out were present in v1.25. The code for the AI system has been rewritten completely, and the result is that the AI not only functions properly again but also acts more like a real human player. It may, for instance, build and use repair ships, but it can also decide to deploy minefields near important vessels, or periodically target the Engine sections of larger ships to slow them down. In terms of graphics we have upgraded the models for the KAD Armed Infiltrate Pod and TUR Cloak Generator to their remastered equivalents, and also made a start on bringing the textures on the Vaygr Artillery (Spear) and EW Frigates up to modern standards. With most of our remastered units now in the mod the graphics department will take somewhat of a backseat, especially after the intense v1.25, and we can focus on some other things such as race (re)-balancing and bug fixes. We have made a start with the former in the upcoming 1.30 update, which will also use some of the some contents included in the V2.3 player patch. The Kushan in particular have been changed in a number of ways in preparation for the future. With regards to the latter, we have fixed the General Failure crash in the Thaddis Sabbah Single-Player mission, so you will now be able to fully play through it. Those were the appetizers. Time for one of the main dishes. 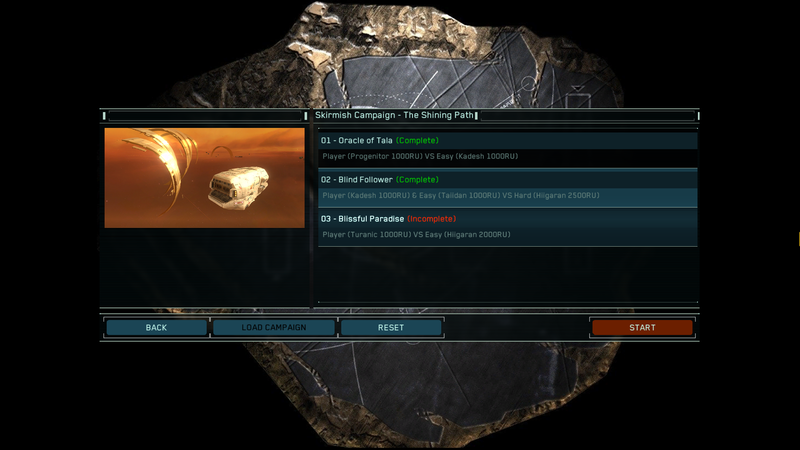 Patch 1.30 introduces a brand new Challenge Mode: Skirmish Campaign. It is the second Challenge Mode to be added to mod after The Legendary Fleet (Wave Defense/Survival), and we are very excited to introduce this feature. Welcome to Skirmish Mode. Skirmish mode, found under Single-Player, is a series of 33 matches. In it you play as, with, and against all races in the FXmod - under certain conditions. Each match has its own preset gameplay rules and map, and the difficulty increases as you progress through. 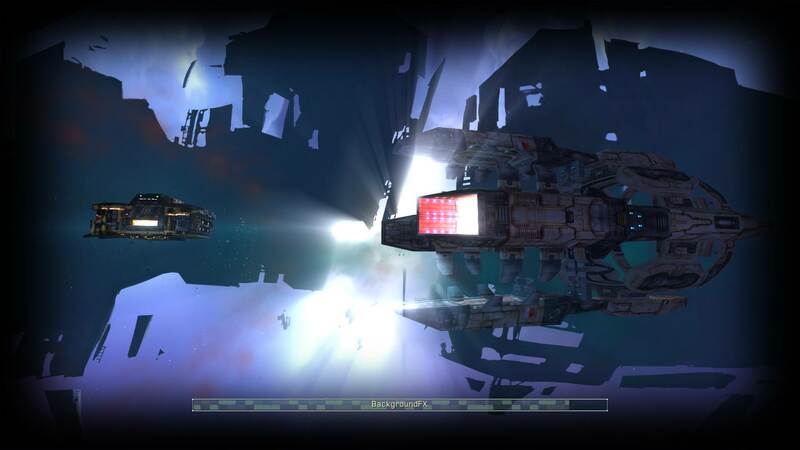 Playing this mode is a great way to discover the strengths and the weaknesses of your race, and can be either a fun something to tackle with the intention of seeing how far you can get, or a challenge during which you'll find out just how far you Homeworld (and FXmod) skills will carry you. Each match counts as a separate Single-Player mission, so progress is saved after every victory. You can resume where you left off, or also redo previously completed challenges. To celebrate the release of 1.30, the new build will also come bundled with an event, where the person who has gotten the furthest in the new Skirmish Mode exactly 2 weeks after its release will get to work together with the developers to realize one of their ideas (or wishes) in the FXmod. The exact details will be posted on here and Steam alongside the 1.30 release. The target is set. Here is to a healthy competition and lots of fun! The full patch notes will be posted in the [Forum] tab on release day, and will also be included with the download. One of the most important ideas of FX:Galaxy's Skirmish mode is balance, for that we've unified all races' resource collectors. In this case, the size of two HW1 resource collectors became inappropriate, and due to collision issues, the harvesting efficiency will be different. So these unused repair corvettes took the place of resource collectors, to make sure every race has a same harvesting efficiency. RPG mode is a biiiig project, patience required. A few more balanced 1v1 maps are currently making, but that's all. Though, we can try to make the mod compatible with workshop map packs in the next version. We've included some contents of V2.3 player patch in the upcoming 1.30 update, and we will try to include more later. 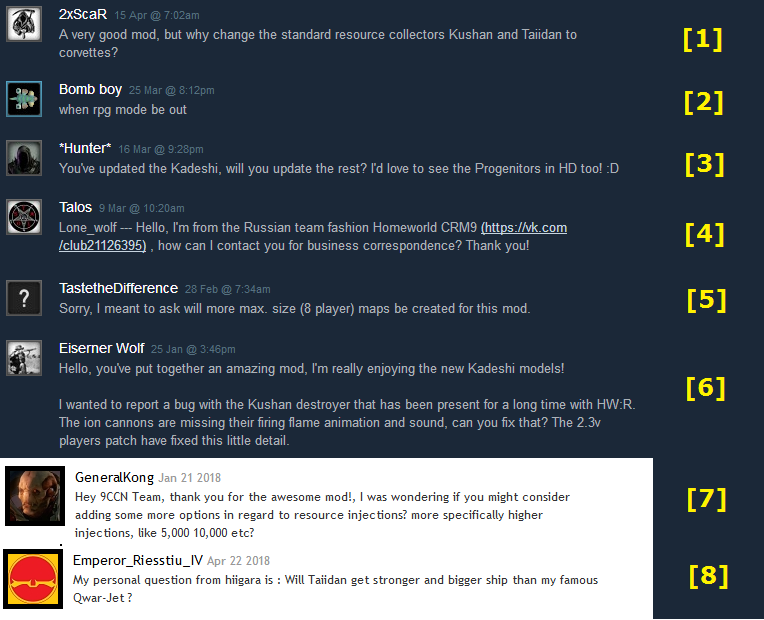 I know higher RU injections were choices in FX:C's Homeworld mode, so yes, we can put them back in the next version of FX:G.
If you saw the trailer of our previous FX:Commander mod v2.0 (for HW2) you may have noticed that such project exists since then, but the information about this are currently classified by the Taiidani, so no comment here. Nice!, thanks for answering my question, Will be looking forward to the update!